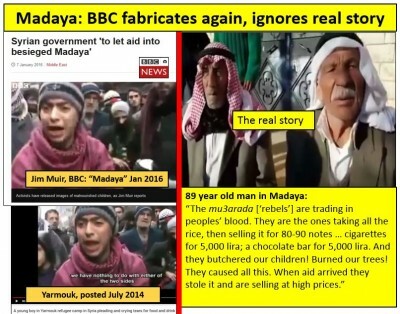 Western television viewers are being bombarded with daily reports about the savage Syrian Army and its barbaric siege of the ‘moderate’ rebel-controlled town of Madaya. If you listen to the media like a responsible taxpayer should, Assad is personally starving all the women and children living in Madaya. The anti-government groups are nothing but traders of people’s blood. They only cared about securing food supplies for themselves and their families, and sell the rest to people for astronomical prices. Ahrar al-Sham and the Nusra Front have food but they do not feed anybody. We had to make do by eating grass.